Colyton is a small village in the Coly Valley, which itself is part of Devon’s Area of Outstanding Beauty. As you can imagine, it was very nice to drive through the countryside to reach the village to visit a customer. 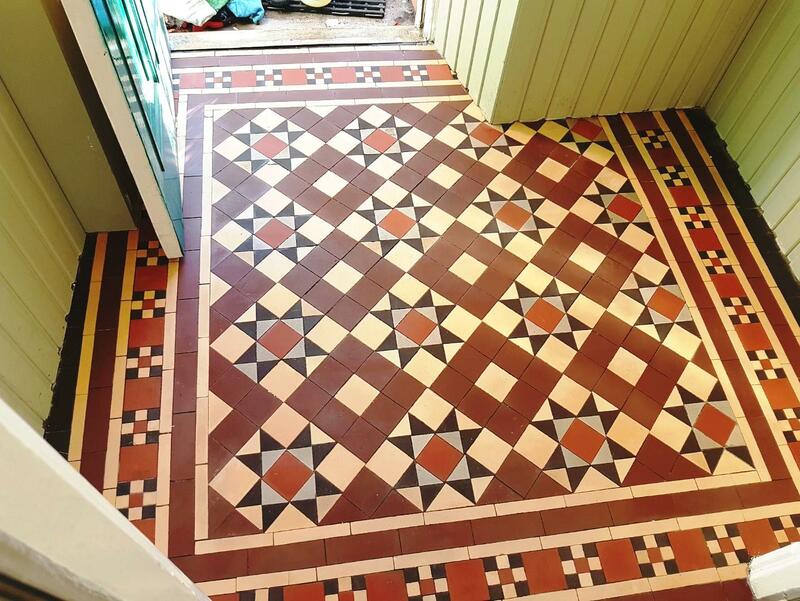 The customer was keen to restore her Edwardian tiled entranceway and hallway in a classic herringbone pattern, which consists of an arrangement of rectangles. 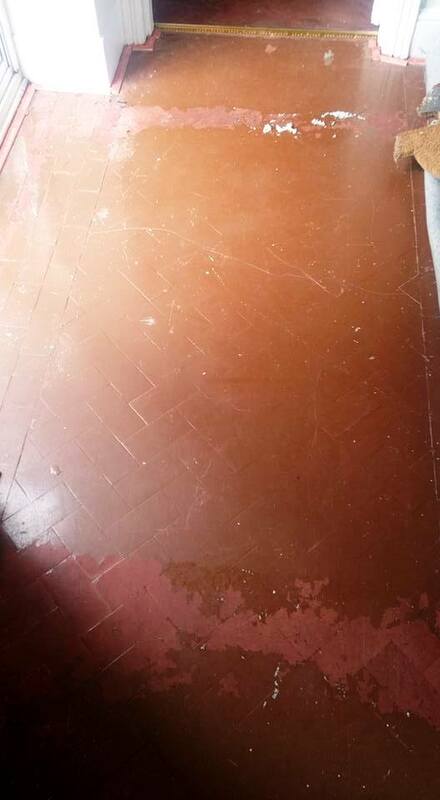 Parts of the floor had been under carpet for a long time and other areas were covered in at least three layers of thick masonry paint. There was some damage to the floor at thresholds where the carpet grips had been hammered into the floor and a few holes with rawl plugs in scattered the area. 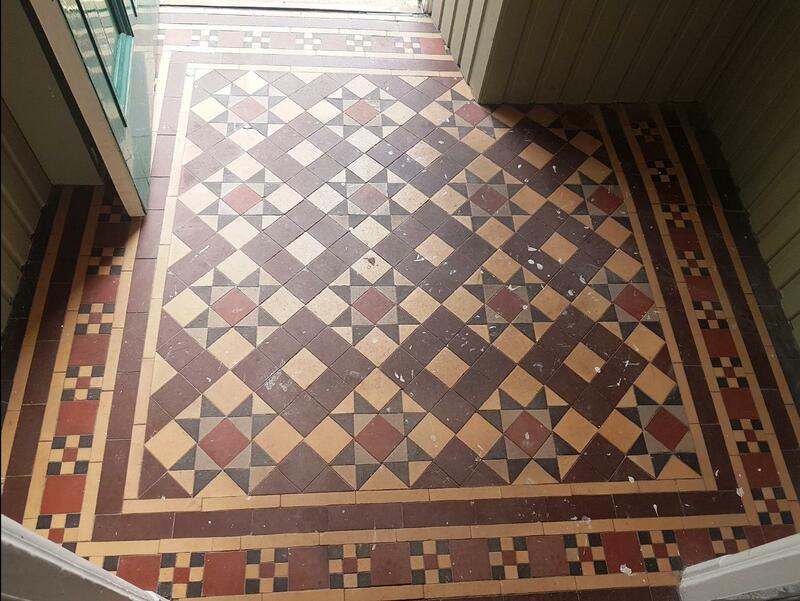 This had left the floor looking worse for wear and all in all, there was a lot to be done to restore the tiles back to their original condition – just take a look at the photos below. Several methods were tried on each area during the initial visit to determine the best way forward including chemicals, diamond pads and heat plus a razor scraper. It was clear a mixture of these methods would be needed to get the best results. On my return, I removed the rawl plugs filled the holes with an epoxy resin in a matching colour. Next I started on giving the tiles a deep and thorough clean to remove not just the copious ingrained dirt, but also the unappealing paint smears. 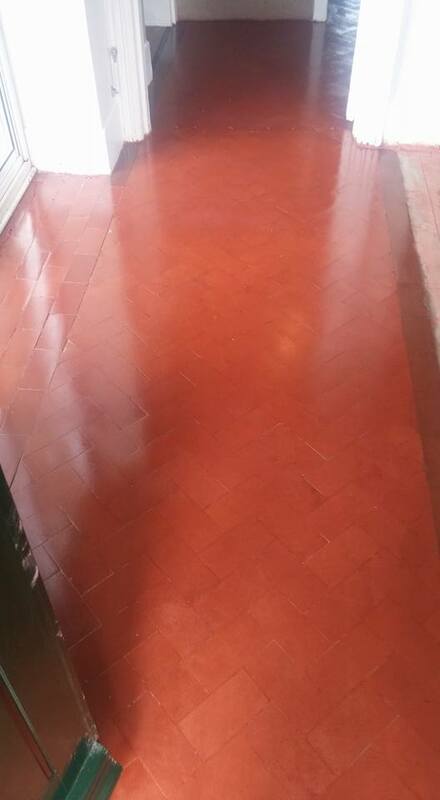 I did this by applying Tile Doctor Remove and Go, which not only cleans the stone, but also strips away any old sealer. Remove and Go is particularly good for removing most artificial coatings and finishes, adhesives, and paints – and can be used on most unpolished natural stone. Next, I give the tile and grout an acid rinse with Tile Doctor Grout Clean Up, which is a concentrated phosphoric acid product, to negate any underlying efflorescence and alkaline salt deposits. 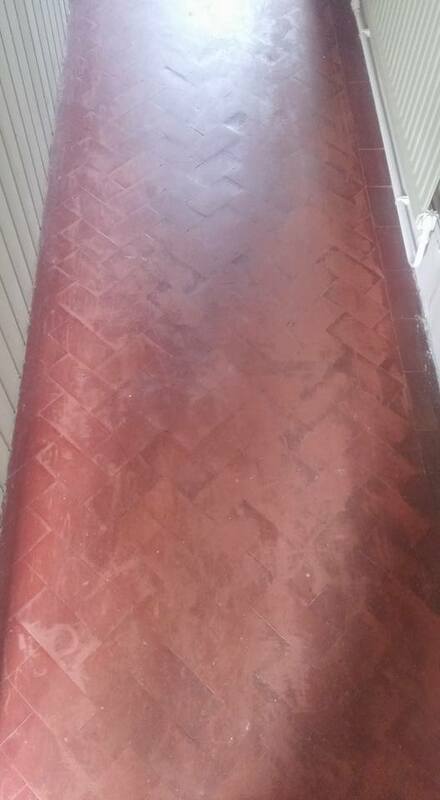 Efflorescence and salt deposits can be common problems for older, original tiled floors because they often lack a damp proof course. 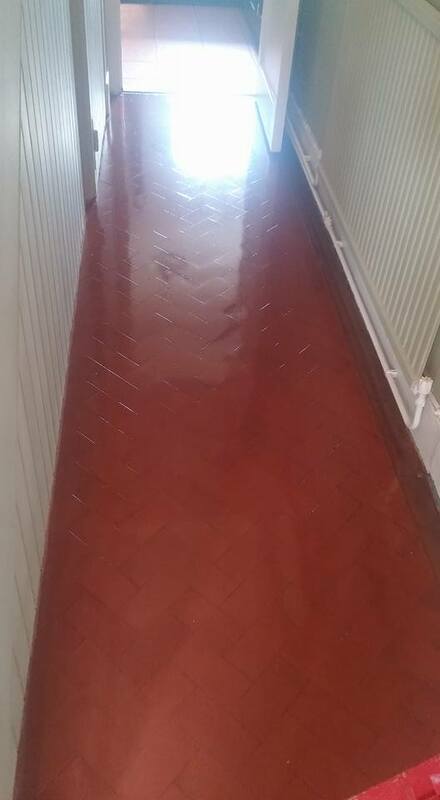 Having finished cleaning the floor, I gave it a thorough rinse using fresh water to remove any traces of chemicals, before leaving it to dry overnight. Returning to the property next day, I ran some quick damp tests to check the floor was ready to be sealed. To seal the floor, I used a single coat of an impregnating sealer called Colour Grow and followed this up with five coats of Tile Doctor Seal and Go. Both sealers will allow for vapour to rise up through the floor ensuring any damp can rise up through the floor in future which is essential for an old floor like this one which has no damp proof membrane. The also combine to provide stain resistance surface and a robust, low-sheen finish. And, with that, the job was done. Two days of work later and the floor is back to looking it best, as you can see in the photos below. Another satisfied client for the Devon Tile Doctor who left the following feedback. “Very good work,we are very pleased with the result.